We are proud to introduce ILLUMY™, the newest member of the GloToSleep family of sleep masks. ILLUMY™ is a comfortable and lightweight sleep mask that helps you fall asleep with gently dimming light and wake up in the morning with an invigorating sunrise. ILLUMY™'s red light sunset tells your mind and body it is time to sleep. After the sunset has dimmed, ILLUMY™ blocks out all external light to ensure you have a restful and uninterrupted sleep. ILLUMY™'s blue and white light sunrise tells your mind and body that morning has arrived. Research has shown that blue light immediately improves alertness and helps to eliminate sleep inertia. Overcome the dragging feeling in the morning and get a boost from a sunrise mask inspired by nature. Do you have a racing or overactive mind when you go to bed and all you want is sleep? You're not alone. That's why we implemented our Sleep Enhance pacing technology which helps to guide your mind to a calm and relaxing state. 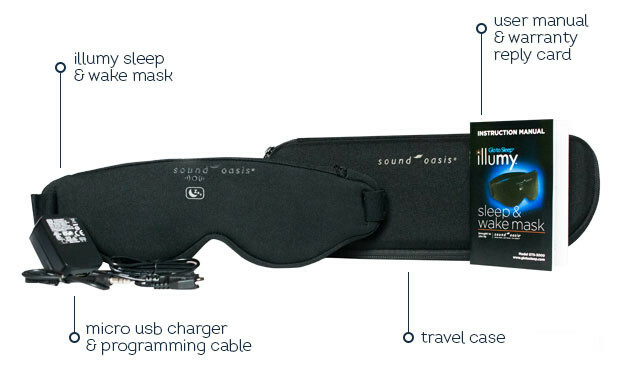 Sound Oasis has used pacing in our sound machines for many years and we're excited to introduce this effective technique in a sleep mask for the first time. When you are lying in bed and your mind is racing, it is generating and operating on fast moving beta waves. Sleep researchers have measured this effect and shown that an overactive mind displays increases beta wave activity and reduced delta wave activity. When you are falling asleep, slow delta wave activity increases and beta wave activity is less prominent. To help you fall asleep and relax, ILLUMY™ Sleep Enhance gently pulses the sunset lights. As the sunset dims, the pulsing slows down from an alpha state (associated with relaxation) to a delta wave pace to gradually coax your mind into sleep. Sleep Enhance also helps you wake up in the morning using the same technique. Before your alarm time, the blue sunrise slowly pulses and quickens to help guide you from delta sleep into alpha relaxation to prepare you to wake up. As the blue light gets brighter and the pacing quickens, you start to overcome that sleep inertia that can be so stubborn. By your alarm time, you are already feeling refreshed and ready to take on anything the day can throw at you. Why is ILLUMY™ so lightweight and simple to use? The answer is in the GloToSleep smartphone App. All of ILLUMY™'s settings including time, alarm, sunrise, sunset, chime and sleep enhance are configured using your smartphone. There are no tiny buttons or bulky clock to struggle and your sunrise and sunset mask is designed to be as comfortable as possible. Download the free mobile App from Google Play or iTunes and start getting better sleep and wake up refreshed right away. ILLUMY™ is perfect for air travel - it blocks out light effectively so you don't have to worry about other passengers opening the window blinds just as you're falling asleep. Travel a lot? The included protective travel case ensures your sleep mask stays in perfect condition and keeps the accessories all in one place. You won't have to worry about keeping track of the charger or cables. The smartphone App allows you to choose your destination time zone so you can plan ahead. Just select "Away" for the clock and select the time for the city you are travelling to. ILLUMY™ will retail for $149.99 (USD) when it starts shipping in December. You can pre-order and pay for your own ILLUMY™ today for only $99.99 ($50 off!). To learn more about ILLUMY™, visit the illumy product page.